The Church of Jesus Christ of Latter-day Saints has welcomed a new prophet, and miss and love their late prophet, president Thomas S. Monson. President Monson passed away on January 2, 2018. He was 90 years old and served as the 16th President of the church. President Russell M. Nelson was sustained and set apart as the 17th president and prophet of the Church of Jesus Christ of Latter-day Saints on Sunday, January 14th, 2018. 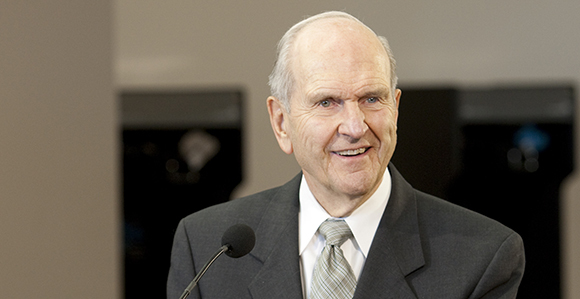 We would love for you to read more about President Nelson's remarkable life and service here. This coming weekend, March 31,2018 and April 1, 2018 is General Conference for the Church of Jesus Christ of Latter-day Saints, and all are welcome to watch, read, and listen to these meetings. President Nelson, apostles, and church leaders will be speaking. You can find out all the details for times and broadcasting in your area at lds.org. The gospel has been restored in the latter-days. God is not silent. We can know His will for our lives by listening to the prophet and apostles called today, and by praying to Him. By the power of the spirit, we can know all things that we need for peace and direction in this life. Please join us and learn for yourself what blessings God and His Son, Jesus Christ, have in store for you. How can I make my prayers more meaningful? How do the roles of men and women complement each other in families? Our blog staff is made up of members of the Church of Jesus Christ of Latter-day Saints, or LDS Church; we are also known as Mormons, because in addition to the Bible we believe in another testament of Jesus Christ called the Book of Mormon. We are thrilled to start up this blog and will be posting weekly about our Heavenly Father, our savior Jesus Christ, the gospel, and different aspects of our faith alongside testimonies (or statements of belief) by other members of our church regarding these topics. Ultimately, our aim is to share the truth of God's love for all of His children and His great desire for us to have real happiness and joy. Thanks for visiting our blog, and we hope you visit us again soon!